Storybook perfect! This 2+Bedroom, 2 Bathroom home sits on a large oversized lot. The 1st floor has a spacious open floor plan that's great for entertaining. You can see the seasons change from your sliding glass doors that overlook your deck, patio and gardens. The kitchen has been updated w/maple cabinets and there are hardwood floors throughout. There's also a finished room in the basement to use as a home office or for guests. Plenty of storage and off street parking complete the picture. Architectural plans are in hand in case you would like to expand one day. Close to transportation, parks and shopping. 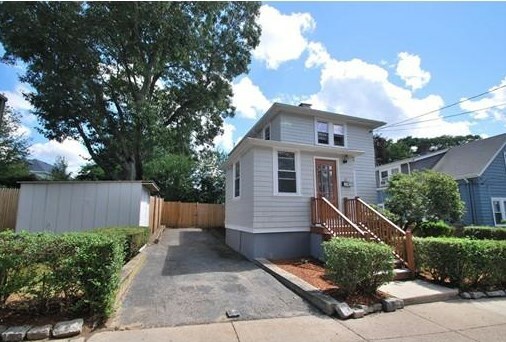 32 Alleyne St, Boston, MA 02132 (MLS# 71972832) is a Single Family property that was sold at $433,000 on May 06, 2016. Want to learn more about 32 Alleyne St? Do you have questions about finding other Single Family real estate for sale in West Roxbury? You can browse all West Roxbury real estate or contact a Coldwell Banker agent to request more information.